We are delighted to offer an extensive range of treatments using only worldwide highly acclaimed products for you to choose from and enjoy, making your visit memorable and beneficial. Every ESPA face and body treatment is a totally caring experience. The ESPA products are as natural as they can be and rich in essential oils, plant extracts and marine elements. Deeply relaxing and de-stressing oils, revitalising seaweeds and nourishing creams help to achieve outstanding results on the face, body and mind. Permanent make-up - Having Permanent cosmetics applied allows you to save valuable time and enhances your features. You can benefit from larger looking eyes with thicker lashes, amazing younger looking fuller lips with permanent lip brush and liner. Perfectly shaped eyebrows that smooth the brow and make eyes look bigger, which in effect gives you instant eye lift without the need for surgery! Medical Microdermabrasion - A thorough exfoliation treatment that is non-surgical and safe. Medical grade crystals are used to remove the dead outermost layer of skin to reveal newer, softer, smoother and brighter skin that is more receptive to treatment products. It can be used to diminish, fine line and wrinkles, sun damage, acne, black and white heads, age spots, hyper-pigmentation, oiliness and dry and patchy skin. Skin is left with minimal redness, swelling and irritation afterwards. This treatment can be carried out on the face and body and is suitable for stretch marks. Jessica hand and foot nail treatments are renowned for their prescriptive caring of the natural nail and offer every colour under the rainbow in polish finishes. A variety of treatments are available from nail shapes and paints to luxurious manicure and pedicures incorporating the heated bootees. The beauty of Jessica is also now available in a gel, enabling a perfect polish finish for up to 2-3 weeks and still with the health of the natural nail in mind. The dramatic effect of having permanent eyelash extensions can be achieved with Marvel-Lash eyelash extensions, which is perfect for a thickened and lengthened look which can last up to 2 months. St Tropez tanning treatments are expertly applied to enable you to be naturally bronzed without any harmful effects. 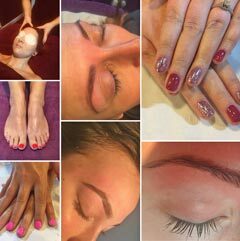 Of course we also offer everyday necessities such as waxing and tinting together with those of a more specialised nature such as, Reflexology, Indian Head Massage and Sports Massage.